It was an 'Aha' moment. Founder and President Steve Gates was searching for an e-bike to give him a boost on Hood River's hills and see its beautiful scenery while undergoing chemotherapy. Soon his wife wanted an e-bike to extend her rideable distance, and his daughter wanted one to cart around her 3-year old. The lightbulb went off as Steve began his search and saw an opportunity to combine his excitement about e-bikes and his business experience. He had been in the watersport business for 30 years (visit our sister company Big Winds), and knew the recipe for success: passion, knowledge and service. 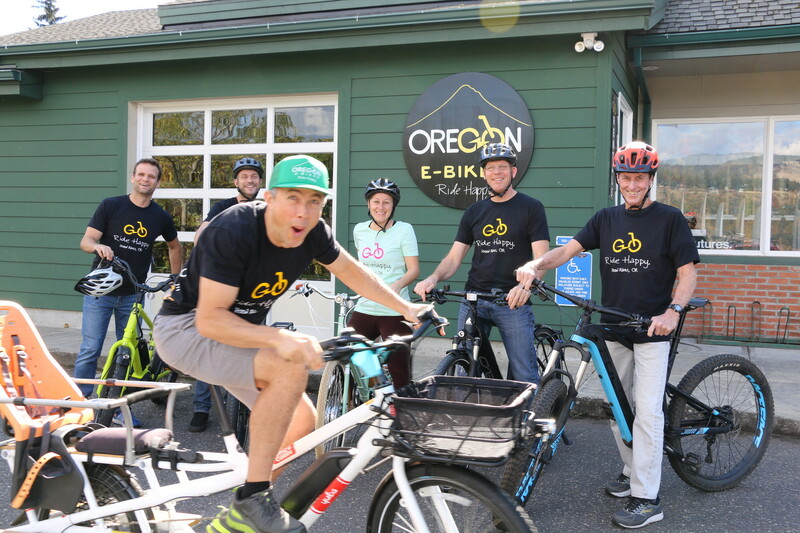 Oregon E-Bikes was born out of Steve's vision and our collective love for biking. Our team is dedicated to all things e-bike, and we each have a unique passion for the sport (meet some of our team). Whether you are on the trails, taking your kids to school or simply out for a cruise, we've got you covered. Our motto here is 'Ride Happy', and we're excited to share our stoke with you.